Pam Loves Lego Winners AND a Special Deal! Buy 1 ring and get 10% off. Buy 2 rings and get 15% off entire order. In order to get this deal, you have to mention Lovely at Your Side in an email to Pam. Offer valid for orders placed on or before Dec 15th. Shipping charges apply. Must have paypal account. Great deal, thanks Pam! 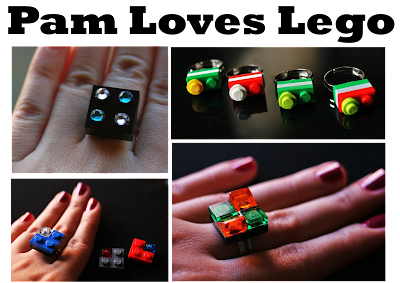 If you loved those Lego or Scrabble rings (and they would make awesome holiday gifts! ), scoot over to Pam Loves Lego and shop, shop, shop today! And congrats to our 2 winners: Laura of Sweet Life Laur, who said "Ooh, I'd love a Z Scrabble ring! So cute!!" and Rachel who said, "I think I'd have to say the Lego one. I can totally see my Son trying to put his little Luke Skywalker lego man on it and thinking his Mom is the coolest." Enjoy your rings, ladies!